And so it has truly begun! Tulips have made an early show, just in time for Mothers Day. Every year it is a struggle to choose which varieties to get, but these stunning peony type tulips are my absolute favourite. They don’t have the longest stem, but the depth of colour and and structure is just dreamy. I’ve also been having fun making these Spring wreaths. As you may know, I love a good wreath! it is fun to construct one that is full of colour and that signifies the beginning of a season, rather than the end. Now that Mothers Day is over I can put my head down and get back to growing. I can’t believe it is April! I want to say a big thanks to everyone who bought vouchers for Mothers Day, I was truly overwhelmed with the response. And if you are in need of some tulips, from now until the end of the month I will have LOTS, so just get in touch or watch out for my Instagram or Facebook posts advertising what is in bloom this week. I am SO excited to get started-YAY! It’s March and I think I can finally start to get excited for the next season. In some ways the winter has felt very long and in some ways it has flown by. And now that it is getting warmer I will be busy taking care of small plants like these, that I have nursed since the Autumn, and sowing new ones that won’t begin to bloom until July. The season will start with my tulips, and after an incident of finding cows in the field, I was a little nervous unfixable damage had been done. But luckily not. They all appear happy, all are pushing above the ground and I am hopeful by the end of March I will start to have some lovely blooms for sale. Next up will be Sweet Willaims, cornflowers, ammi magus and a whole host of delights. Last winter lasted so long, and my flowers were so long coming, that I don’t actually know what this year will be like. Will my peonies come early? Will my perennials make an early show? Will a beast from the east ruin all my hopes and dreams for an early start to the season? But no matter what the end of winter has in store for us Spring is definitely on the way and before long I will have more flowers than I know what to do with. This year I have doubled the size of the cutting field. This means PYO flowers will be even more of an adventure and I have enough flowers to begin a subscription service, bringing fresh British grown flowers from my farm to your door for just a tenner. (Think Freddies Flowers but BETTER) I also can’t wait to help all the brides who have gotten in touch, wanting my DIY flower buckets so they can have beautiful flowers on their wedding day without breaking the bank. So yes, I am very excited for Spring and everything that follows, and I hope you are excited as well. It may seem funny to write about Christmas in February, but it is actually nice to go back and reflect. I had assumed that after November, things would quiet down and I would be left with loads of free time. I am thankful to report of the opposite being true! December was one of my busiest months yet and I LOVED IT. 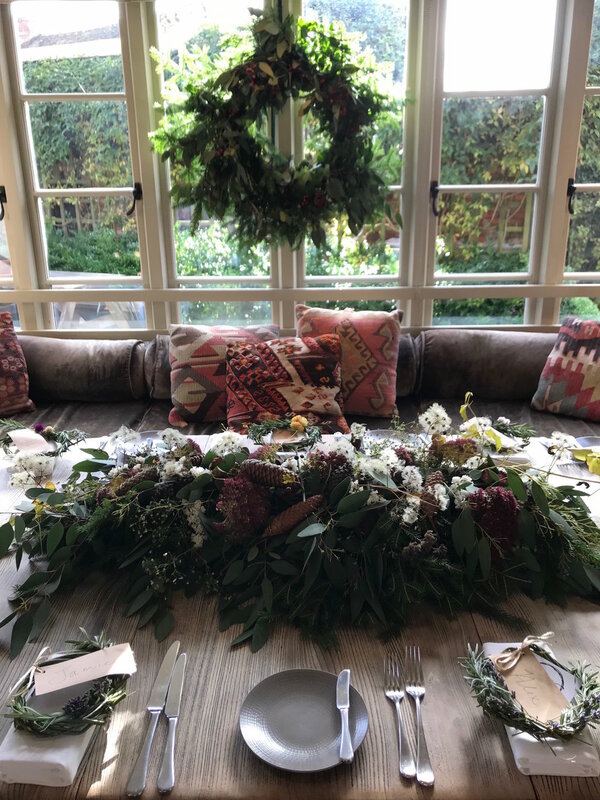 I loved making the giant wreath for the window (turns out I love wreaths) and the smaller version for the place settings made from willow and dried flowers. The centre piece I wanted to make sure was bold and beautiful but low enough and small enough to enable conversations and food to be shared. I also had the great pleasure of decorating The Hundred of Ashendon for the holidays. A favourite local of mine I wanted to make sure I I made the displays striking but also very natural. 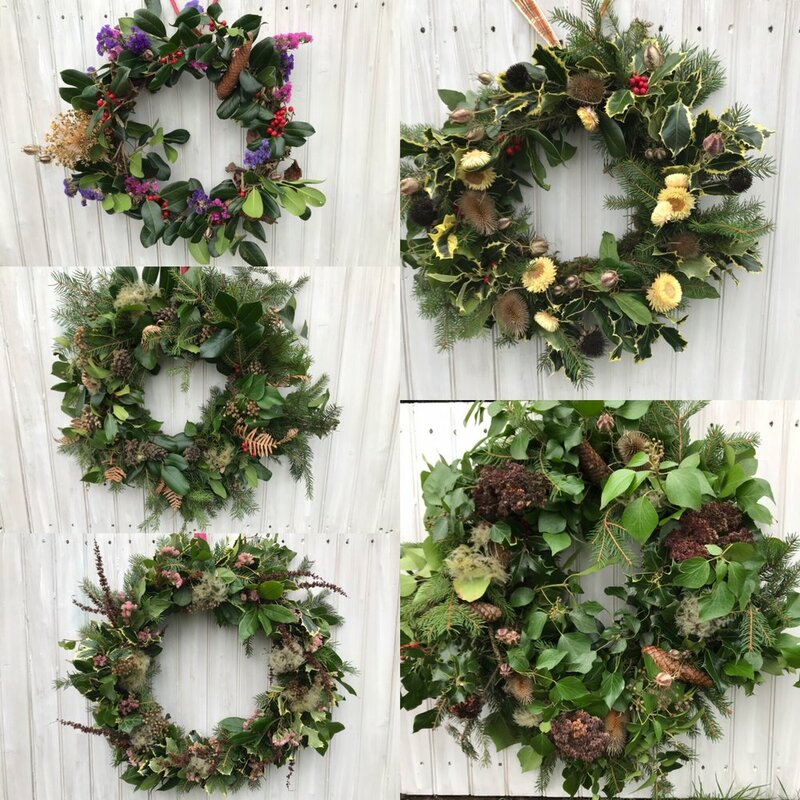 I also ran four wreath workshops this year and they were all amazing. I love Christmas and spreading the Christmas cheer and it was so amazing to help people get creative and think about wreaths differently. Using lots of flowers grown on the farm and dried, I tried also to incorporate lots of different greenery to make every wreath special and unique. Each one of these made me massively happy and I hope it made the participants happy as well. And then there were all the made to order wreaths! I’m not going to lie, I love making a wreath, I really do. Each one takes about an hour and each one is made special for the person who ordered it. No two were the same. So yes, February is a strange time to talk about Christmas but it is also really good to look back to see everything that was accomplished. Things are finally a little quieter here but I can’t wait for it to get busy again, which won’t be long. Seeds need to be sown and that flower field isn’t going to expand itself! 2018 Can it almost be over? Whoops-Did it again. Too long between blog posts. Its life. It gets in the way and there is never enough time. But today I am making time. You see my season is coming to an end, and I thought this was a good time to make a review in photos. So I put together pictures of my flower field this growing season, and again it almost made me cry. What a year! Winter was very long to end and it has come back rather too soon. Although unseasonable warm today we suffered frosts at the end of September, ending my dahlia season about a month before I expected to. The flowers are all coming to an end and now I am digging them up, covering them over, and expanding. It is quite exciting really. And I love the physicality of it. But I am sad to see it end. But then I remember, I still have WREATHS and I love a good wreath. I have really enjoyed crafting my own willow bases and and can’t wait for our wreath workshops in December. Not to mention making custom made wreaths for all of you. So yes, it is the end of the season, but not really. January, then I can rest. Ah! I promised myself I would never let it go longer than a month between posts and look! Its been two! A lot has changed in two months. And I am really excited to be in this moment right now thinking about it. An arrangement from our last workshop-loving all the colour! First off I closed the shop. Im not sad. I loved the shop, it was amazing to me and to a handful of other people. But it took up a lot of energy and time. Energy and time better spent developing Howe Farm Flowers and making a brand and name for myself. So I have re-directed all that energy and I am sooooo glad that I did. It is nice to focus on just one thing. And already I have seen the positive impact. 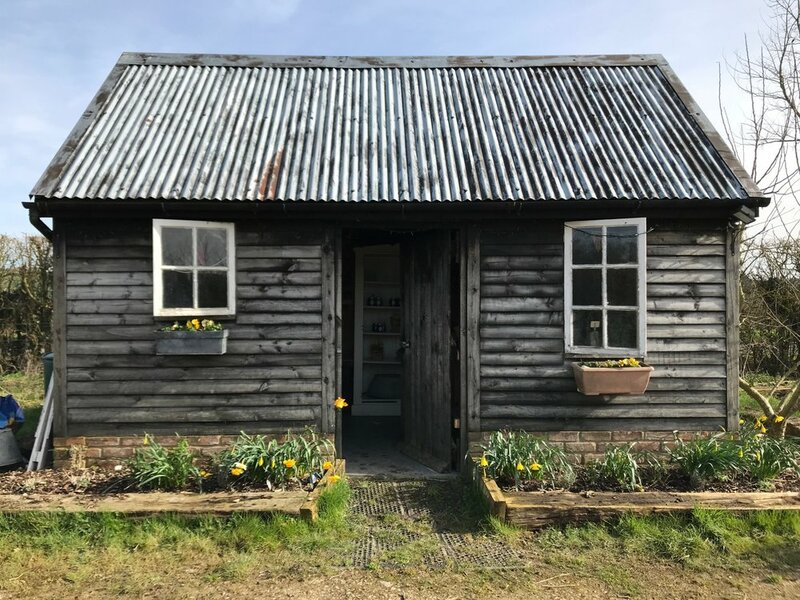 Perhaps when Howe Farm Flowers is better known I will think about opening the shop again, but for now I quite like welcoming people to the farm instead for them to see what is happening up close. So instead I have been doing workshops and making the farm more available for people to visit. PYO flowers has really taken off and every weekend I welcome people to take time out to enjoy the outdoors, share space with some buzzy bees and immerse themselves in nature. And the Flower Mornings are proving more enjoyable than I could have imagine. I love spending time telling people what I know about flowers and watching them be creative. But really, what I love the most, is sharing the flowers. I love watching people leave with armfuls of blooms and feeling inspired. And with a smile on their face. I love to make people happy. Coming up I am hoping to do some wreath making classes in the winter and pretty soon 26 more tones of compost will be delivered so I can start expanding the cutting field. I will be at Haddenham community market this Saturday and I am always available to make arrangements for collection or delivery. I am quite excited about my little business. It brings a lot of joy. I went to the most amazing place over the weekend. Green and Gorgeous and if you know of it than I don't have to tell you what a cut flower haven it is. Four acres of flowers in bloom, flowers budding and flowers just waiting to get started. I loved it. The above image is an arrangement I did using her blooms. Those ranunculus nearly killed me. Being there it was hard not to feel impatient and disappointed that my flower patch is so far behind. How is she able to grow stunning ranunculus and I have failed for yet another season? Sweet peas already?! And just look at those flowering shrubs. But then I stop and think. This is my first year growing flowers on a large scale and these things all take time. My shrubs are small right now but in ten years time they too will be full of blooms. My perennials need time to settle in and set their roots. And ranunculus, well, all I can do is try try try again. So please bare with me as I get going, and be patient. Soon I am sure there will be more flowers than anyone would know what to do with. And have faith that year after year things will only get bigger and better, including myself. (well hopefully just better, not necessarily bigger). Ta-dah! Our lovely little farm shop has finally opened its doors for the season. I couldn't be more pleased. I love my little shop. It is filled with lots of lovely things that represent lots of hard work by lots of different people. Its also an opportunity for me to meet my customers, catch up with friends and occasionally have a sneaky peak at a book. I have always tried to keep the shop full of things grown and produced from the farm. From veg and flowers to jam and cake, everything has always come from these two hands. 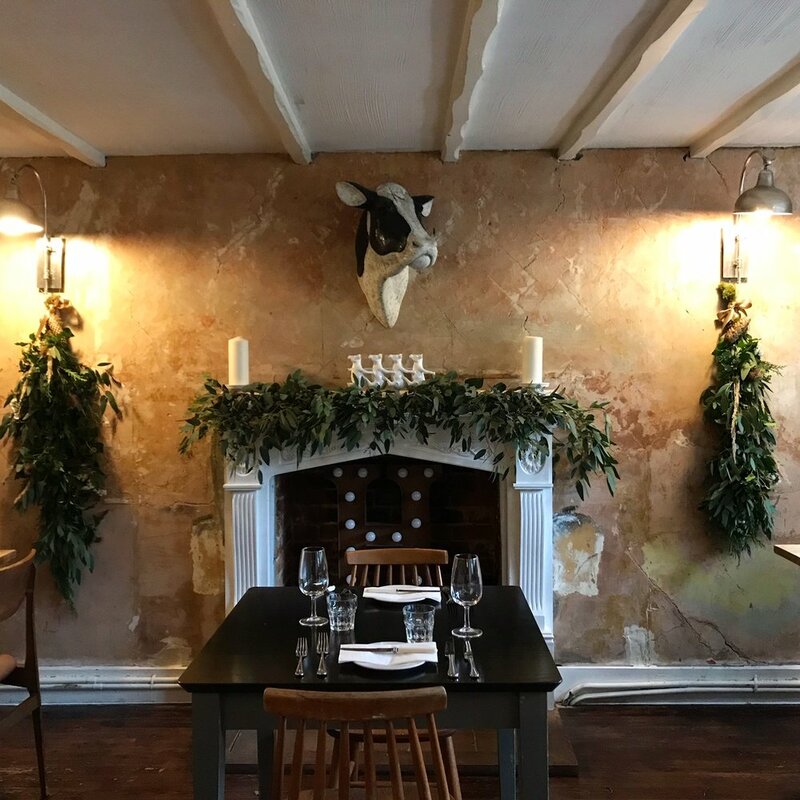 But now that my time is more limited, and I have given myself focus, I am proud to say I have actually let go a little and branched out a little, supplying free range eggs from the amazing people at Dinton Farm and lovely organic, seasonal vegetables from our local supplier. (and when I say local, I mean LOCAL), and occasional plants from Northend Nursery. That said, I bake all the cakes, make all the jams and ALL the flowers supplied in the shop are grown, cut and arranged by myself. Although it has been a really hard Spring, with very little ready to be cut now, I take great pride in what we are trying to accomplish here and I will find it very rewarding when later in the season people will ask, "did you grow ALL these flowers" and I can proudly say "YES!". So come by and say hi and see what is coming into bloom. Fridays 3pm to 6:30pm and Saturdays 9am-12pm. I thought I was finished with my flower field about a month ago. In my mind I had laid 12 rows of compost which was approximately half of one side of the one acre plot. (otherwise known as a quarter acre) I still had plenty of soil but I thought this is a good stopping point for this season. Then Martin came along and applied actual math and measurements to the situation and it looked like no, I was not done. Not even that close. and planted out my ranunculus I started inside. I am actually hopeful they will grow! (I have had bad luck with these beauties in the past) Roses have been pruned, they just need to be fed, and I can get started planting the very fine shrubs I bought a couple of weeks ago. So all in all I am feeling pretty good! Today. We had an amazing time. Blue skies, short sleeves, walks on the beach and invaluable family time with dads, grand-dads, sisters, brothers, nieces, nephews, cousins, etc. But truth be told I was excited to get home. Time with my family is always amazing, but I couldn't wait to get into the green house. I wanted to see how the seeds I sowed before holiday were fairing and get cracking on my spring sowing. Days would be longer which surely would mean warmer as well. Right? It's a bit disappointing. I was hoping to spend my baby free time finishing my last row of laying compost in the flower field and sowing sowing sowing. Instead I have spent most of my free time hauling water to the cows, making sure they have had enough to drink. Its ok though. Perhaps this means we will be awarded with a cracking summer. And when it does warm up and blue skies come again, we will appreciate it all the more. And when I see my first seedlings spring up, I'm going to do a little dance and thank them. And appreciate them for the valuable things they are. A sign that Spring is surely on its way. For those of you who follow me on Instagram and Facebook, remember when I got my compost delivered and it looked like this? It was really exciting. And very daunting. Today, as I wheeled what must have been my thousandth wheel barrow load of compost, I was beginning to feel like this mountain of dirt is never going to go away. It is still taller than myself and when I look at it from a distance it doesn't look like it has changed what-so-ever. So I took another photo, with the addition of Oscar who you can just about make out. Now my pile of dirt looks like this. Looking at this image I feel so much better. There is a mighty difference! I am sure in no time my mountain of dirt will be gone. And it will be the source of thousands of beautiful cut flowers. Humble beginnings.